Work & Co partners with YouTube in several projects. I've been working on and off on vision concepts for YouTube.com and YouTube Go. Partnered with Expa to match tavelers to premium seats and shared charters. Join the waitlist. I've been working with the team at Acorns on their app since 2016. Beacon seamlessly connects aircraft operators and maintenance teams to keep planes in the air. Vivo Easy, the best work from our collaboration with Vivo in 2017—18. Life insurance that's actually simple. First one to do it all online. Renzo Piano, Stephen Doyle and Work & Co partnered with Chris Wittle's team to reimagine education. Helped Oscar make health insurance simpler. Best plan comparison on the web. Get a quote. In Work & Co's first year we designed the Smithsonian Channel website. Love the video page. I worked on the original design for HouseLogic.com in 2008. Then I redesigned it in 2016. Partnered with Michael Bierut's Pentagram team on this. The current design for Itau.com.br was led by me. It was made in 2010. Worked on a beautiful version of Newsweek in 2013. Remember that CNN site? I worked on it in 2009. Also here. I led design for the Pepsi Refresh Project from 2009 to 2011. Read on AdAge and Wikipedia. I'm a designer and Founding Partner at Work & Co, a product design and development firm with offices in Brooklyn, Portland, São Paulo, Rio de Janeiro and Belgrade. We started the company in 2013 and we're about 250 people now. Previously I was Partner, User Experience at Huge, where I headed the UX discipline across seven offices worldwide. 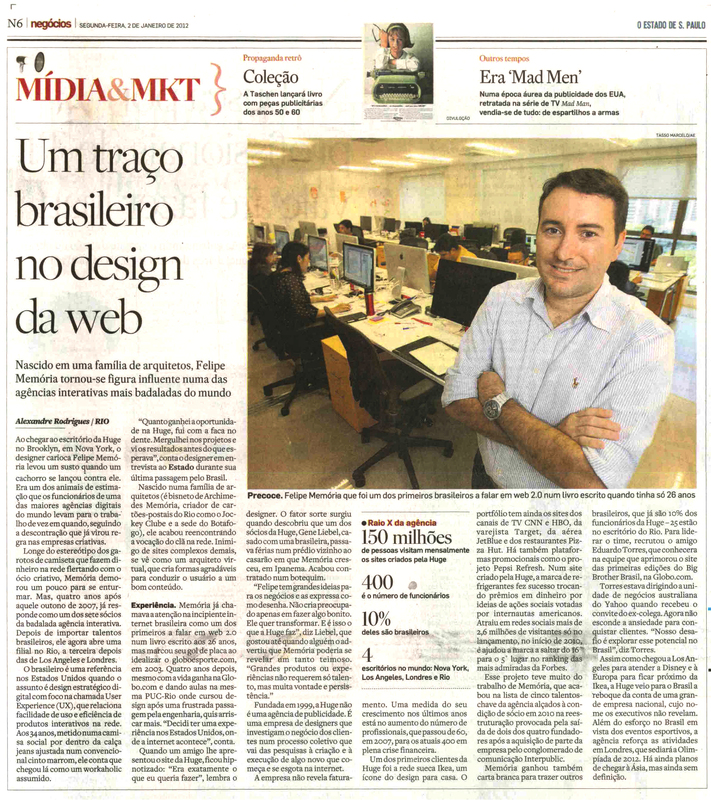 Long bio: I started my career in Brazil where I led design in a team at Globo.com—the largest media company in Latin America. We did good work at the time, including the creation of the most popular sports site in the country. While at Globo, I wrote a book about User Experience that ended up becoming very popular with the local design community. It sells pretty well to this day, even though it was written in 2005. I moved to the US to work at Huge in 2007 when the company was only 60 people. In three years I was made partner. I led the design of some of Huge’s most successful projects - including HBO GO, TED Talks, Pepsi Refresh and CNN.com. I also founded the Rio de Janeiro office, helped Huge expand to Portland, and helped grow the offices on the West Coast and in Europe. In 2013 I left to found Work & Co. We are a team composed by many of the most talented people I know. I have a MS in Usability and HCI and a BS in Visual Design, both from PUC-Rio, where I also taught for two years before moving to the US. I’m a member of the IADAS and served as judge in several industry competitions including the One Show Interactive. Personal: I'm Brazilian, American and Portuguese. I was born and raised in Rio de Janeiro. The Memoria family has a tradition in architecture. My great-grandfather, Archimedes Memoria, was the first of them. I was fortunate to grow up surrounded by great references: from Joaquim Tenreiro furniture to living in an award winning building designed by my mom and later in a house designed by Archimedes. Today I live between New Canaan and DUMBO with my wife Mariana, who's a partner at a Brazilian Bakery in Soho, and my son, Pedro. I often go to Brazil for business. For more about me ask around. VirginAmerica.com was the project that launched Work & Co. It got a lot of attention from the industry and has been widely studied, copied and referenced. Read the Forrester Research report and the UX Pin case study. Watch Joe Stewart and I speaking at the UX Awards, where we won the Grand Prize. The project has won 18 industy awards including a Cannes Lion and three Webby Awards three years in a row in three different categories: mobile, best practices and user experience. I've been working with Eurosport in Paris on and off since 2012. I've designed Eurosport.com, their global design system across apps and the Eurosport Player for the web, iOS, Android, Windows, Xbox and PlayStation. The Player's unique, consistent UI accross platforms is printed on top of the full screen video no matter the page. For that design we've won a One Show Pencil, a Pixel Award and were also a finalist for the IxDA Awards. Check out the Eurosport Player case study. Oi was the founding client from our Rio de Janeiro office. They're sort of a Brazilian Verizon. I've been working with them on and off since 2011. We've worked from their offices from 2014 to 2016 to design and build the new oi.com.br. My last project at Huge was the responsive redesign of TED. My favorite feature was the video page mini player that later was copied by several sites. The project won seven Webby Awards in 2015. HBO GO is likely to be the most successful product ever launched by Huge. Our first project was the iPad app. In parallel, we designed the iPhone and Android versions, and later a prototype for smart TVs. Then we designed for Roku, Xbox, Kindle and PlayStation. One of the main ideas was the continuity concept—users could start watching in one device and resume from where they left in another one. It was the first time this was ever done. HBO GO won more than 10 industry awards. Design para a Internet was published in 2005. The book is basically about UX and was published in Portuguese only by Elsevier. It ended up becoming very popular and it somehow influenced a generation of designers in Brazil. I wrote it in one month almost without sleeping. I was 26 at the time. O que é que esse site tem? Você confia em segurança na internet? I sometimes joke I'm the world's greatest specialist in Breadcrumbs. That was the theme of my thesis. Do they work or not? The answer: only if people are really lost. But if people find their way via other methods, breadcrumbs are completely useless. The thesis is in Portuguese only.